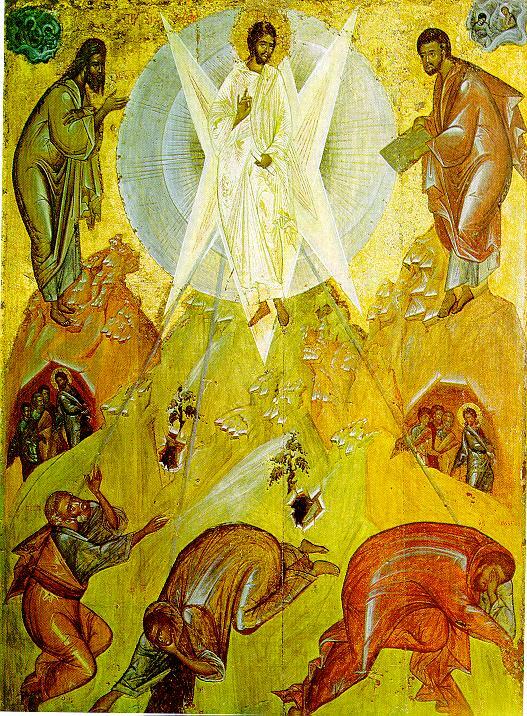 August 6 is the Feast of the Transfiguration. Here are some texts, images and thoughts. The icon above is from the hand of Theophane the Greek. He was one of the greatest iconographers of all time. He was a Greek who emigrated to the lands of Rus’, worshiping and painting in these northern states, far from the comforts of the Byzantine Empire, in the 14th century. His work endures as hallmarks to be studied, learned from, and imitated. Would that such could be said of us 800 years after our deaths! The feast of course is the great revelation of Jesus to Peter, James, and John – his three closest friends from the Twelve and the disciples – on the top of Mount Tabor. Elias/ Elijah appears, affirming that Jesus is the long-awaited Messiah. And Moses, the Law-Giver, affirms that this is the Voice which gave him the Law on Mount Sinai, all those centuries before. I like Peter! He is so human, so impetuous, so bold, so loving. He says what he feels, and he feels passionately. It must provide each pope something to reflect on as successor of Peter – do I love my Lord and my Church with such passion? Tomorrow, I will make up a basket of fruit. I will take all the things in season: red strawberries, blueberries, blackberries, peaches, nectarines, apples, but above all else, grapes. Grapes give us the wine which becomes the Blood of Christ, and so these have to be in every basket which goes to church on this holy day. In 1973, this was the day on which we buried my father’s mother, +Antoinette (LePrell) Zugger. She was a little lady, with dark eyes, a ready smile, a green thumb, and devoted to her faith. Every morning she would sit down with her novenas and her prayer book and spend time praying. She lost her husband in a railroad incident in which someone threw the wrong switch in the big railroad yards that still surround East Lovejoy/ Iron Island on Buffalo’s East Side, and killed him, back in 1924. My father was all of four months old. From that tragedy, she emerged as a pillar of faith. When we buried her, I was lost in grief. I had learned German from her, spent days living with her as a little one, and had nursed her in her last illness. I was 18 and heading off to college in a few weeks. But my world was shattered when she died. I wanted to know if there was any kind of a sign regarding the day, and so I looked up the Transfiguration as a result. And I saw that this day can, for us, become a day in which to set aside the earthly things, and reach out for the Lord. My grandmother’s soul was on its way to heaven – when she would get there I did not know. But I did know that she was going to have a share in this radiant, shining glory. Ultimately, she was going to be admitted into that transfiguring glory, and when she did her soul was going to be illuminated with God’s shining Light. And at the resurrection, her body and soul united would shine as well. It was a good preparation for becoming Byzantine Catholic a few years later, after three years of worship in the parishes in Williamsville and Olean, and a lot of years reading about and studying icons. It is a great feast, a day on which we should really try to find some quiet spot, even if for five full unbroken minutes, and ponder the mystery of God Become Man, and thank Jesus for His great mercy, but above all, for His awesome love. He shows us Who He is on August 6th, in blinding light, but a light which is healing and not fearful, which is illuminating, for our souls and minds. Have a great feast!